The Dividist Papers: Hello. My name is #TDS Dividist. I have Trump Derangement Syndrome. My name is #TDS Dividist. I have Trump Derangement Syndrome. 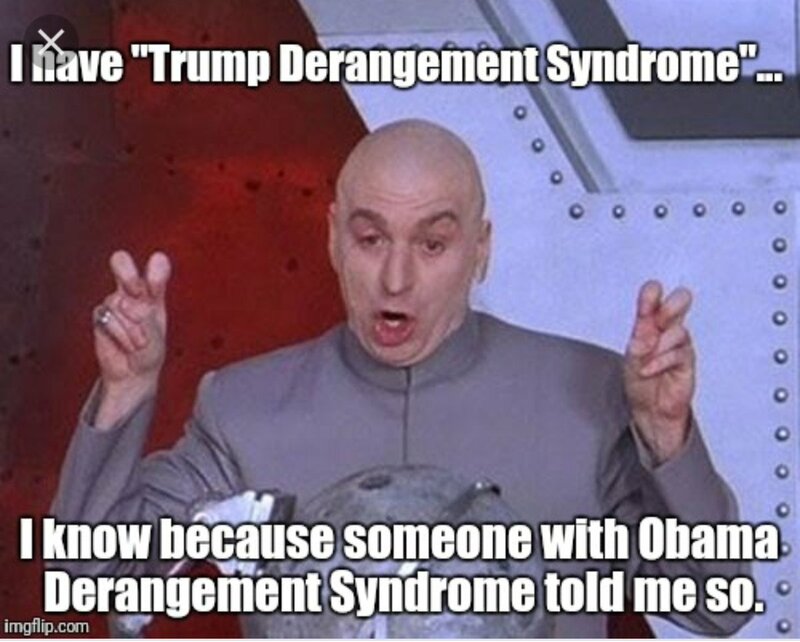 Yes, I have TDS (Trump Derangement Syndrome). If you are not familiar with the symptoms, CNN, Wikipedia, and Urban Dictionary have all diagnosed the affliction. I had TDS before #TDS was cool and well before the President of the United States discovered the term. One advantage of being a blogger, is that I can easily track the progression of the disease in my blog posts. My symptoms date back to 2015 and have a distinct Kubler-Ross flavor, including - Denial, Anger, Bargaining, Depression, and even grudging Acceptance. How can one not have TDS with an unfettered President exhibiting such profound authoritarian tendencies and seeking to push the envelope of executive power in direct contradiction to the word and intent of our Constitution? But it didn't start with President Trump, and there's the rub. Even when my early symptoms of TDS emerged, I was still deep in the grip of ODS (Obama Derangement Syndrome). How could I not, with an unfettered President exhibiting profound authoritarian tendencies, bypassing Congress with the Executive Order overreach, illegal war actions, defending indefinite detentions, drone execution kill lists, and warrantless searches? And that's not the worst of it. President Obama's overreaching "I have a Pen & Phone" Executive Branch excesses could only be achieved by standing on the shoulders of the expansive Unitary Executive definition promoted during the Bush/Cheney "Power Grab". Yes, I was also afflicted with Bush Derangement Syndrome. How could I not, with an unfettered President (Vice President?) exhibiting profound authoritarian tendencies, with executive branch usurpation of congressional war powers; erosion of 4th Amendment search and seizure protection, rationalizing torture and renditions in violation of the Geneva Convention; blurring the line between Church and State; and undermining 1st Amendment free speech protections? In my own defense, I never succumbed to the worst symptoms exhibited by those who let this affliction untether their tenuous grip with reality. I never believed that Bush was illegitimately elected because the GOP stole the election in Florida, or the nonsensical "Truthers" claim that Bush knew about 9/11 in advance. I never believed the preposterous "Birthers" claim that Obama was illegitimately elected because he was not born an American citizen or the more insane notion that he was a 'secret Muslim." That said, I do believe pretty much everything Michael Wolff, James Comey, and Bob Woodward reported in their books. I even believe the anonymous New York Times OpEd writer about this dysfunctional administration. But I don't believe Omarosa. I have limits. So there's that. 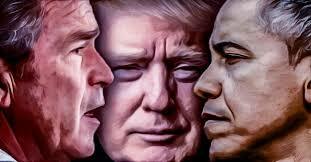 So we have three Presidents representing two different parties and multiple constituencies across the political spectrum, and yet my affliction only gets more acute with each subsequent administration. Perhaps it isn't me. Perhaps it's a problem with the Presidency itself. The clear trend is toward an ever increasing appetite for unilateral action on the part of our executive branch, made possible by the equal and opposite abdication of the constitutional responsibilities of our legislative branch. 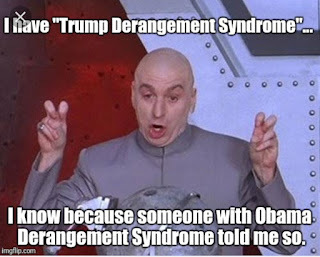 Perhaps the affliction is not Trump Derangement Syndrome (TDS), but Presidential Derangement Syndrome (PDS). Presidential Derangement Syndrome affects more than just a given president’s opposition. 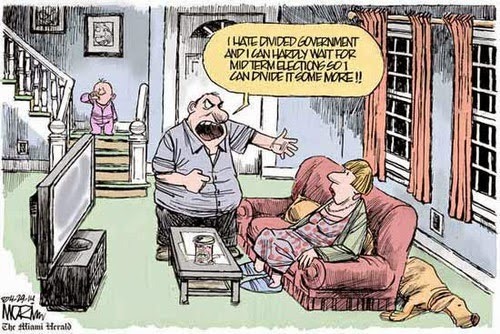 There is always a reaction to the reaction enough to make the left and the right switch their political roles. After years of damning the presidency of Barack Obama in hysterical terms — from accusing him of being a secret Muslim born in Kenya to being a Marxist agent trying to destroy and “fundamentally change” the United States from within to a man asleep at the wheel who callously left military men to die in Benghazi — the right wing has dropped their oppositional posture, now opting to play the role (at times reluctantly) of court historians and palace apologists for President Trump. On the other side, after years of forgiving Barack Obama’s domestic half-measures, covert intrusions into American life, and more wars abroad, the left wing has dropped their love of executive power, now deciding to play the role of democracy’s great defenders against the idiotically ineffective yet somehow still dangerous presidency of Donald Trump. These are the signs of Presidential Derangement Syndrome. Boiled down, such an illness creates dishonest and hypocritical partisan hackery. And, despite wonderful claims and aspirations that Donald Trump’s ineptitude will lead to the demystifying of the great American presidency or the destruction of its credibility, I am not so hopeful this will occur." a federal government with the power to supervise virtually every aspect of American life, from kindergarten, to marriage, to the grave." President Bush’s constitutional vision is, in short, sharply at odds with the text, history, and structure of our Constitution, which authorizes a government of limited powers." "This essay will explore the growth of executive power in the Bush and Obama years and the key role congressional abdication has played in that growth. 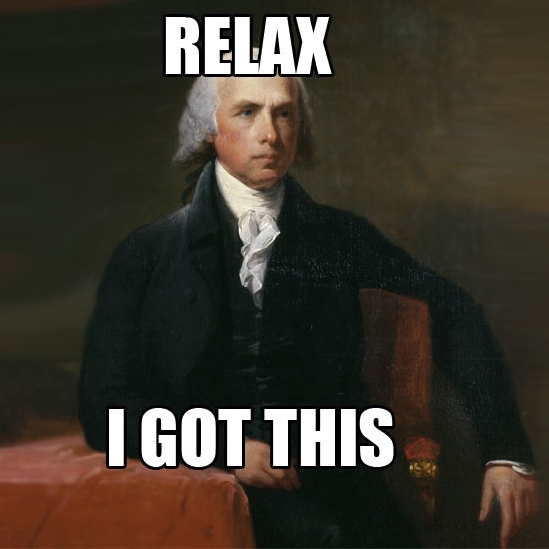 I‘ll begin with a brief discussion of Congress‘s dominant role in the Framers‘ original design and James Madison‘s vision of a self-reinforcing constitutional order in which individual ambition could be properly channeled to preserve the interbranch balance of powers. From there, we‘ll look at how Madison‘s plan has worked out in foreign and domestic affairs, focusing chiefly on the last two administrations. Given the presidency‘s increasing dominance at home and abroad, the answer is, not very well. Finally, I‘ll suggest some reasons for the failure of the Madisonian vision and ask what, if anything, can be done about it." "Any attempts to stem the growth of presidential power will have to confront not just the damage done by Trump but also the deeper problem that damage has exposed: that the bodies charged with constraining presidential power have been steadily losing both their willingness and their capacity to rein in presidents. Many have written eloquently, particularly since 9/11, about the need for checks on presidential power. But the reality is that Congress is in no shape to reclaim its role in foreign policy—and neither are the other traditional sources of constraint on U.S. presidents... This is now the unchained, unconstrained presidency. It didn’t start with Trump, but it has exploded since he took office, and Americans will be living with its consequences for a long time to come." "Although foreign policy has never been fully isolated from politics, political polarization began to rise in the 1970s, and it increased sharply in the 1990s. Today, members of Congress reflexively support their own party. In periods of unified government, this means extreme deference to the president. 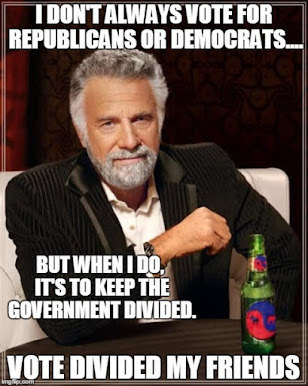 In periods of divided government, it means congressional gridlock. Neither scenario yields much in terms of congressional oversight." In 1994, 2006, and 2010 the voters decided to reign in the unified one party rule governments functioning as lapdogs to the Clinton, Bush and Obama administrations respectively. In all cases the overreach, arrogance, and corruption those unified governments engendered were replaced with a divided government that effectively constrained the worst executive branch impulses for the balance of their term. We have an opportunity to do the same again in 2018. "A skeptical public tends to vote for divided government, which in turn leads to greater policing of the executive branch. William G. Howell and Jon C. Pevehouse have found that when the public rewards the opposition party, the result is more vigorous policing of the incumbent administration‘s conduct, including many more congressional oversight hearings. In our public discourse — especially in Washington, D.C. — we tend to view distrust as a political pathology. But should we? Skepticism toward power lies at the heart of our constitutional culture, and if it makes it harder for presidents to do great works, it also makes it harder for them to abuse power." Reinstating divided government doesn't mean our government will always make the right decisions on foreign policy. Divided government does not solve "the deeper problem" of failing "to cultivate and wield expertise" that Goldgeier and Sounders find so problematical. OTOH, it is not clear to me that a unified government relying on the "best and brightest" foreign policy brains-on-sticks is any guarantee that we will avoid foreign policy disasters. Certainly it is true that gridlock in a divided government may limit the ability to implement the kind of sweeping foreign policy initiatives that Goldgeier and Sounders seem to long for in their piece. Just as certainly divided government limits the range of actions available to the executive branch and makes it more difficult for any administration to unilaterally act on their worst foreign policy impulses. To my mind that's a pretty good tradeoff. Goldgeir, Sounders, Healy and Clark share the same pessimism about Madisonian constitutional constraints to adequate corral the modern unitary executive. In my view, if there are a few holes in the constitutional fence, a little Cognitive Madisonianism on the part of a few independent voters can patch it up in November. 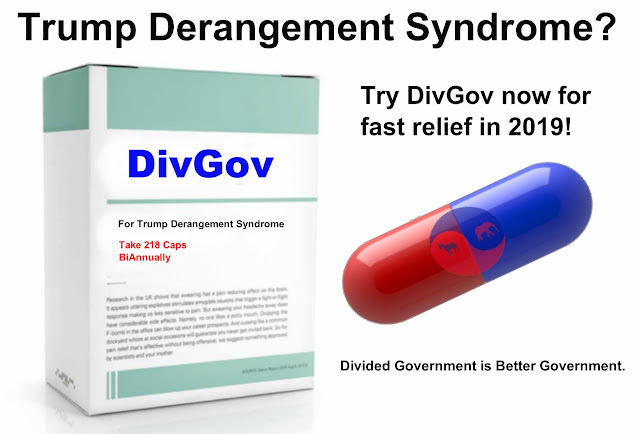 Trump Derangement Syndrome is the disease and divided government may not offer a complete cure, but a divided government outcome after the the midterms will certainly help relieve the symptoms. Take one or two branches of congress, and call me in January.